At St Vincent’s Institute, we believe in providing opportunities for students to learn from our researchers, and for our researchers to have their work seen and questioned through the eyes of a student. A win-win for everyone. 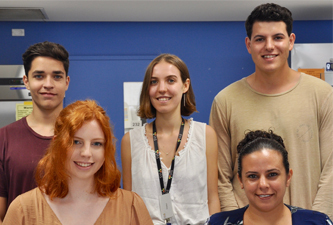 During the annual summer break period, SVI attracts talented undergrad and post-grad students from a variety of backgrounds and interests; some are already set on their career path, while others are looking for lab experience to help them clarify their career options. Dr Wayne Crismani from SVI’s Genome Stability Unit hosted student Imogen Reay over the summer break. He says, “Mentoring students is important as it allows us to pass on our scientific knowledge to the next generation. There is no substitute for spending time one-on-one to teach what are often very abstract concepts”. Imogen said she was motived to study science because she “loves the way in which science can be used to better the lives of others”, and says the highlight of her time at SVI was “working with the ever friendly and patient Genomics Stability team; they have been wholeheartedly welcoming”. Other students who participated in our undergrad placements and post-grad studentships, included Emily Derrick, who worked in Associate Professor Jörg Heierhorst’s Molecular Genetics Unit, and Oliver Cucanic and Inaki Voelcker, who are currently working with Dr Tom Brodnicki and Professor Helen Thomas, in the Immunology & Diabetes Unit. If you are a student interested in doing a placement at SVI, please check the ‘Students’ page on our website for more information.